A new, muscular conservatism led primarily by those in their 20s has arisen in recent years though it is open to everyone, perhaps partly as a response to a confrontational and occasionally violent new left and/or a belief that conservatism’s intellectual and political leaders don’t seem all that different from their alleged ideological opponents. Barred by the cultural gatekeepers from traditional media outlets, these new conservatives have taken to the streets, online videos and blogs and may have even “memed�? Donald Trump into the presidency in 2016. They’re angry and they don’t have much of a problem fighting back against the bike lock wielding Antifa protesters they face off against, whether through action or words. Every movement needs its fictional literature and the new conservatism has responded in kind. 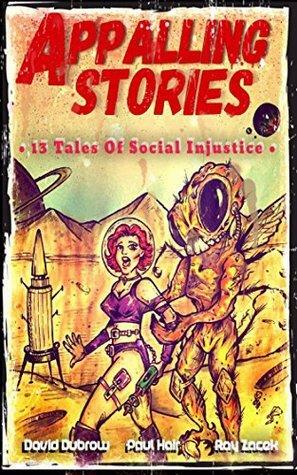 Amongst the recent entrants is Appalling Stories: 13 Tales of Social Injustice, a collection of short stories available both in paperback and Kindle, by David Dubrow,‎ Paul Hair and Ray Zacek. The trio tear into political correctness, social justice warriors and anything that reeks of the leftist moralizing that seems to have taken over every aspect of our modern culture. Each of these stories is disturbing on a cursory level but a careful reader but notice that although they are fiction, it doesn’t take too much of an imagination to envision their becoming reality. Appalling Stories opens with Dubrow’s “Bake Me a Cake�?, the story of a baker that refuses to make a truly obscene cake – even the description isn’t fit to print on this web site – for a gay wedding and finds himself at the center of a media storm and ends with Zacek’s “Detainer�?, a revenge mission by man whose son was killed by an illegal immigrant. In between are short stories that are often humorous if disturbing and others that are just plain disturbing, such as Hair’s “Our Violence Isn’t Violence�?, a brutal depiction of Antifa protestors meeting with a truly blood-soaked and violent end. As one would expect this sort of effort, the varying stories do differ in tone and intent. “Our Diversity is Our Strength�?, a tale of a US Army platoon in Afghanistan that is expected to be more worried about cultural concerns than the bullets whizzing by their heads is satirical of today’s American military brass while “The Bitterness of Honey�? is a surreally noir-ish story about enviro-terrorism that technologically resets the world. “Melanie’s Becoming�? has elements of revenge horror as a delusional man murders white, heterosexual males in the apparent belief it will help him transition into a woman. Short story collections generally suffer from differences in quality but for the most part Appalling Stories holds a fairly consistent level across all thirteen stories, perhaps with the exception of Zacek’s “The Orishas�?, a tale of a resort that caters to a certain type of elite that takes masochistic pleasure to a new level. As a story goes it certainly fits within the theme establish by the other entries but it didn’t seem to work as well as the other ones. It is a credit to this collection that most readers will probably wish the stories were longer or another entry revisits some of these same characters and themes. Appalling Stories isn’t for every brand of conservative. Doubtless for some of the older school – those who recall Kirkian or Buckley brands of conservatism fondly – some of the stories might come across as overly coarse or simple fantasy for those more enthusiastic than experienced. They may wish to use their own experience, however, to recognize that while several of the stories may seem exaggerated to appeal to the deplorables of America it wasn’t long ago that today’s world would have seemed outlandish to them. Dubrow, Hair and Zacek may have written the scariest kind of fiction, the kind that has the very real possibility of coming true. Hopefully Appalling Stories creates a few more woke individuals on the right. Buy Appalling Stories: 13 Tales of Social Injustice at Amazon.com by clicking here. Steven Martinovich is the founder and editor of Enter Stage Right. © 1996-2018, Enter Stage Right and/or its creators. All rights reserved.